Nothing will ever top the Real Housewives of Beverly Hills seasons with the original cast members. The show that originally blessed us with story lines about sibling relationships, addiction, domestic violence, adultery, and divorce is now subjecting us to a multiple-episode arc on being late to lunch and countless scenes with the Housewives packing and picking outfits. OG cast member Adrienne Maloof opens up about the impact of the show on her marriage with now-ex-husband Paul Nassif, her current relationship status with Jacob Busch, and the possibility of returning to the 90210 as a full-time Housewife. Cougar mama is back on the prowl! Former Real Housewives of Beverly Hills star Adrienne Maloof and her boyfriend of more than a year, Jacob Busch, have called it quits on their relationship! So much for those engagement rumors! Adrienne, 53, and Jacob, 25, started dating shortly after she split from her first post-divorce boy toy, Sean Stewart, 34. Jacob and Adrienne were first seen together in late fall of 2013. Jacob even made a few cameos with Adrienne this season on RHOBH. We have an all new round up of hot reality star pics for you this week! Gretchen Rossi had an “impromptu” photo shoot with a cameraman while pushing her dogs in a stroller this week. Adrienne Maloof attended a Halloween party with her sons and her boyfriend Jacob Busch. LuAnn de Lesseps held her estate sale and co-stars Carole Radziwill and Heather Thomson stopped by. Lisa Hochstein, Alexia Echevarria and Marysol Patton partied together at an event while their former co-star Joanna Krupa was seen grabbing a flight. Also spotted this week: Kris Jenner promoting her new cookbook, Bethenny Frankel running around NYC, Ramona Singer filming scenes and Sonja Morgan glamming it up. Take a look at the pics below! Isn’t this taking a publicity stunt too far? Everyone’s favorite May-December couple Adrienne Maloof and Jacob Busch are talking about taking their relationship to the next level. While promoting Never Hungover Elixir – the latest in Adrienne’s never-ending line of products – the former Real Housewives of Beverly Hills star confessed that she and Jacob are discussing engagement. Adrienne, 52, isn’t concerned about their 28-year-age different as she gushed, “When you meet someone they don’t have a number on their forehead. When we met we just hit it off. It felt so natural, so organic.” As a result the chemistry-less couple is “very close” to a proposal. Adrienne has been promoting her new "Gypsy Jewelry" and her newest boytoy Jacob Busch is along for the ride. Mizz Maloof was at the Glendale Galleria this past week to celebrate her new jewelry line and to show off the pieces. Adrienne posed for pics with her new beau, but apparently didn't spring the extra $$ for a real sized step and repeat to pose in front of. Sorry, it had to be said. Last night the Real Housewives of the West Coast (aka Beverly Hills and Orange County) flocked to the pink carpet for a party thrown by Life & Style (one of Housewives' favorite go-to gossip mags). 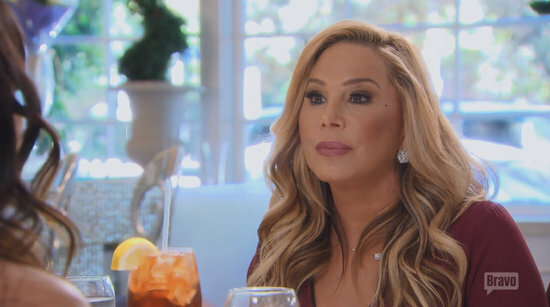 Things may or may not have been a little awkward for the ladies of Real Housewives of Beverly Hills as their former co-star Adrienne Maloof showed up (with her boy toy of the moment Jacob Busch). Kim Richards posed for photos with Adrienne, but Brandi Glanville appeared to have steered clear of her. Also in attendance for the party: Real Housewives of Orange County stars Alexis Bellino and Lydia McLaughlin, along with their husbands. New Beverly Hills cast members Carlton Gebbia and Joyce Giraud were also spotted, along with a few non Housewives – Gloria and Laura Govan, Giuliana Rancic (the hostess of the event) and Patti Stanger. CLICK THE CONTINUE READING BUTTON FOR THE PICS!